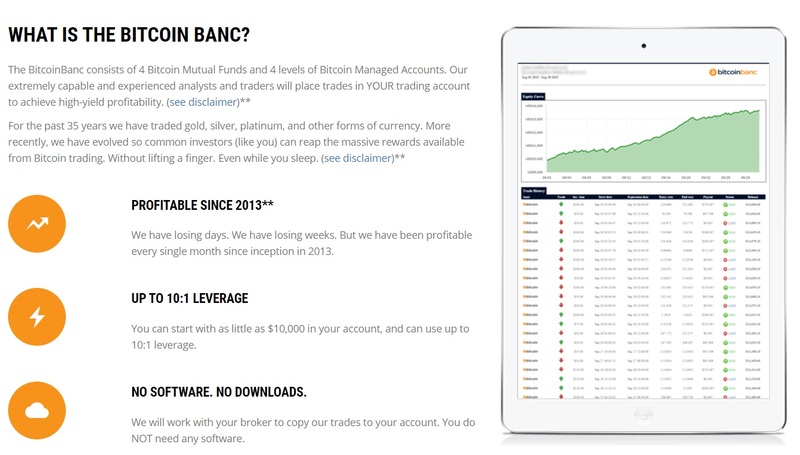 The Bitcoin Banc Review – Scam Warning! Bitcoin trading in general seems like a rather shaky proposition for most people most of the time, but bitcoin auto trading is almost certainly a scam. This however, is exactly what The Bitcoin Banc peddles. They require people to deposit money with them, which they will then use to trade bitcoin profitably. They aren’t even talking about some marginal profit here and there either: they promise 10-15% a month. That is indeed the very definition of too-good-to-be-true, and that’s exactly what this whole operation is. According to thebitcoinbanc.com, the official site of the operation, revenues generated through their scheme are 100% passive. What this essentially means is that if you invest $1,000 with them, you’ll get $100-150 at the end of the month, without any kind of effort on your part. If this smells a bit like a pyramid scheme to you, you may indeed have caught the right scent. Thebitcoinbanc.com does indeed feature an About page, which is more than one would expect from an operation of this caliber. If you’re hoping to learn a thing or two about the corporate background of the outfit though, you’re in for disappointment: on the About page, we’re fed some general nonsense about a “team of professional forex traders” who have apparently gotten tired of keeping all the money they made and decided to share the goodness with others…No information is shared about the company behind the platform or the people responsible for the operation. The contact page does feature a Google maps pin though, according to which, the operation is based in the middle of what appears to be an orchard, on N Minnewawa Avenue, in Fresno, California. A couple of emails and phone numbers are provided as well: [email protected] for general support purposes and [email protected] for those looking to join forces with the operator and convince gullible people to join the scheme. The phone numbers are: +44-(20)-38072827 for the UK and 13472968143 for the US. It has to be pointed out though that none of the above information tells us anything about the people behind thebitcoinbanc.com, or the company that’s pulling the strings. That is obviously a major red flag legitimacy-wise. Instead of letting us know who we’re dealing with, the About Us page gives us an additional glimpse into the inner workings of thebitcoinbanc. Apparently, there are two platforms available for clients, both of them featuring passive revenue streams. The first one hands all trading over to robots. The second one has actual human traders do the work, but from the perspective of the trader, this platform is as passive as it could possibly be, too. The Bitcoin Banc calls the deposits made by its clients “mutual funds” and it features several account-tiers. The Introduction Portfolio will apparently only place 2 trades per account per day, resulting in a lower risk-profile, as well as lower profit-potential. We then have the Premier Portfolio, with 4 trades per day, followed by the Elite Portfolio with 6 trades and the Platinum Portfolio with 10. The managed accounts are structured into several tiers as well: we start out at the Basic level, with 2-4 trades per day. The Silver Portfolio will place 4-6 trades per day, but it requires a deposit of at least $100,000 or 300 BTC. The Gold and the Platinum Portfolios complete the selection, setting the maximum to 12 trades per day. The Mutual Funds Performance section of the website gives us an idea about past profit-percentages racked up by the operation, on a monthly basis. The lowest numbers in this regard are in the 5% range, while the highest shoot past 20%. Despite all the information provided on account tiers and performance, we are offered no specifics on how the actual trading is conducted. The vagueness is the hallmark of Ponzi scheme-based operations. A Google search on thebitcoinbanc brand will reveal quite a bit legitimacy-wise as well. Most of the reviews featured are negative ones, with close to every one of the reputable reviews site blacklisting the operation. The marketing-engine powered by the affiliate deal offered by the operator does seem to work, though miracles it cannot produce. The positive reviews are hosted by various dubious sites, such as one designed to clue people in on how to meet hot women, and they all contain affiliate links to the operator. While the Bitcoin Banc doesn’t yet have a large-enough footprint at Reddit, people over there seem to be on to their antics as well. Several users have posted links to various scam- and blacklists, and essentially no one endorses them in any shape or form. The Bitcoin Banc website (thebitcoinbanc.com) doesn’t inspire trust either. Its Alexa rank is above the 700,000 mark, which obviously isn’t impressive to say the least, especially when one considers that the domain has been live for more than 3 years. Also, according to Alexa, almost 96% of The Bitcoin Banc’s traffic comes from the US. Needless to say, the identity of the domain registrant isn’t revealed either. All we know in this regard that the domain has been registered from Scottsdale, Arizona. Considering all the above, it isn’t surprising that the domain’s authority rank is a mere 14/100, and that it’s already racked up a spam rank of 3/17. Only 4 unique domains link to it, a couple of which are actually relevant for the crypto currency niche. Nobody at BitcoinTalk has ever talked about thebitcoinbank in any kind of terms, unfavorable or otherwise. The above-painted picture makes it quite clear that in thebitcoinbanc’s case, we are indeed dealing with a Ponzi scheme-based scam. The operation aims to bring in “new” client money through the affiliate scheme and through their “way too good to be true” promises, to keep the scheme going. According to the bitcoin community, anything that has auto-trading brought up one way or another, is most likely a scam. The Bitcoin Banc makes a very shoddy case in this regard: it never actually spells out how its robots/expert traders are capable of gleaning such high profit-percentages off the simple trading of bitcoin volatility. After all that, the fact that no one is willing to put their name on this scam is hardly surprising. Verdit: The Bitcoin Banc is a SCAM! If you have been scammed, please tell your story in a comment below. We may also be able to help you recover lost funds in case you have been scammed. You’re also welcome to contact us if you would like to consult with us about your bitcoin investment strategy.